Hello, just a quick post to let you know about my next Jewellery workshop at Resonate Arts House in Alloa on Saturday 4th Feb, 10am - 12 noon. 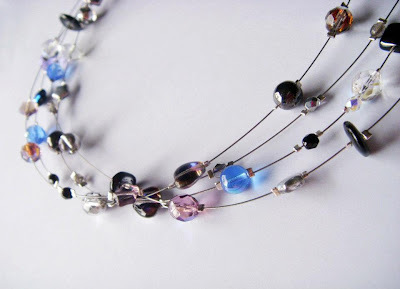 Learn basic stringing and crimping techniques and make a beautiful multi-strand necklace. The workshop costs £20 and this includes use of tools and all materials are supplied (plus tea and coffee!) To book phone Resonate - 01259 928014. If you click on the picture below (which is an example of the necklace we'll be making) it will to take you to my facebook photo album of jewellery samples made at the Resonate workshops. Also we have "Jewellery Club" starting at Resonate on Wed 1st Feb, 6 pm - 8pm, Cost £5. Basically at Jewellery club you turn up and either bring your own beads/findings or buy some from the Resonate shop, ask me what you want to make and I'll show you how. Some people like to bring old and broken jewellery and I help them turn it into something new. The Jewellery clubs run every fortnight so February dates are 1st Feb, 15th Feb and 29th Feb.